The following are instructions and matching photos for removing the packaging of microchips without a proper chemical laboratory. Neither a hot plate nor a fume hood is required, and the only chemicals necessary are fuming nitric acid and acetone. 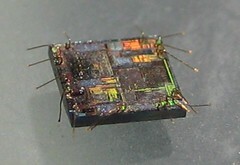 The result is a bare die, with bonding wires. 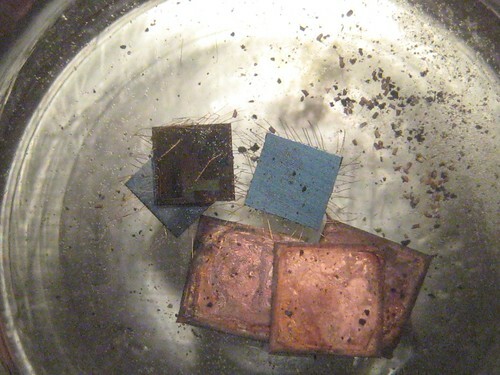 The bonding wires may then be removed and the die photographed using microscope. The same as any author of a lay chemistry article, I must caution you to be very careful with the procedure that I describe. If you've no prior experience with chemistry, purchase an introductory book and study the safety instructions thoroughly. Nitric acid in these concentrations is nasty stuff, even when cold. You will need two small vials with wax-paper seals, high-purity HNO3, acetone, tweezers, and a few pipettes. A fume hood is not required, as the reaction will be performed at room temperature. Safety glasses are recommended. 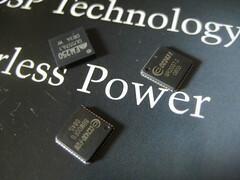 Surface mount chips are preferred for this method, as they have considerably less packaging to dissolve. I chose the CC2430, CC2431, and EM250 chips because they were handy, but also because I don't yet have die photographs of them. 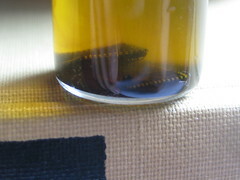 Begin by dropping the chips to be decapped into a vial. 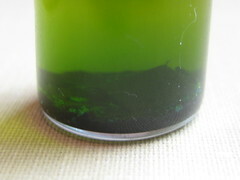 Then add nitric acid to cover the chips, plus a bit more. This will react slowly, rather than violently, but for safety's sake be damned sure never to look down any sort of glassware when mixing in a new reactant. You will see the reaction as small bubbles that come from the chip casing as it dissolves. 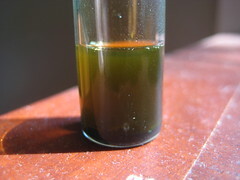 This will slowly turn the nitric acid from yellow to a dark green. Agitate it occasionally to ensure that all of the plastic gets a chance to break away. 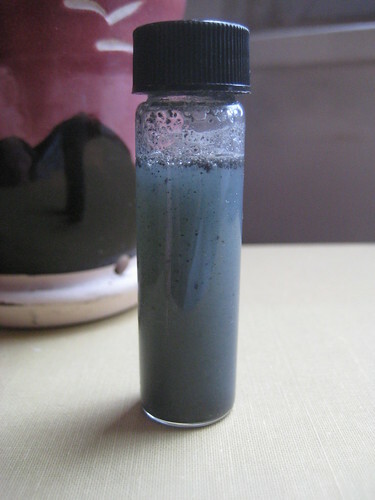 Leave the mixture overnight, allowing the plastic sludge to settle to the bottom of the vial. The liquid above it is still-potent nitric acid, which may be skimmed off with a pipette. Save this in a second bottle for future use, but do not reintroduce it to your bottle of clean acid. 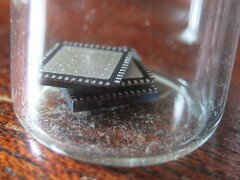 Once decapped, each die should be cleaned in acetone. For microscope photography, the bonding wires ought to also be plucked by tweezers. Interesting. I don't think I'll try that at home, but it's a nice trick to know of. I wouldn't mind some more close-up die photos of the CC2430/CC2431. To see how different they are in reality (the only difference should be their "location engine"). As usual, thanks, Travis, for good work and inspiration. It take just a little knowledge to how to dilute plastic.Cool! Where'd you get the nitric acid? Could you please specify the type and purity of the HNO3 required? Is it Red fuming or 99% white fuming will do the trick? Cesar, 99% white is necessary for cold decapping. With enough heat, 70% will also work in a proper lab setting. Did you know that you can shorten your long links with Shortest and get dollars from every click on your short links.